One of the most iconic training aircraft in history was the T-33 Silver Star. The project started a few years ago, but didn’t go beyond some of early phase of the construction. I was in the middle of a transition and got lost in all the life’s hussle. I bought the Academy kit for a bargain at a local swap deal. It is a modest kit that has great potential for improvement. If you have little resources, you can easily make some extra effort to super-detail the model. When it was time to came back to restart the project, I was confident that adding extra needed detail to the basic model was the way forward. Additionally, I thought about marking this model for an aircraft under the Indonesian Air Force (TNI-AU). The TNI in the early 70’s was in shambles. After the failed 1965 Communist coup d’etat, Indonesia had to ground the whole air force aircraft and associated equipment due to lack spare parts. It was a stunning blow for a once-mighty air force that had at one time more than 150 Soviet-block jet fighters . In the mean time, there were only a handful of serviceable western planes. One of them were these T-33 which the TNI-AU purchased by swapping MiG-21 F-13 airframe. The shark mouth Silver Stars came about when Indonesia was involved in the armed conflict over East Timor in 1975. When the TNI wanted some firepower to fight the war in Timor, they came to these T-33s. 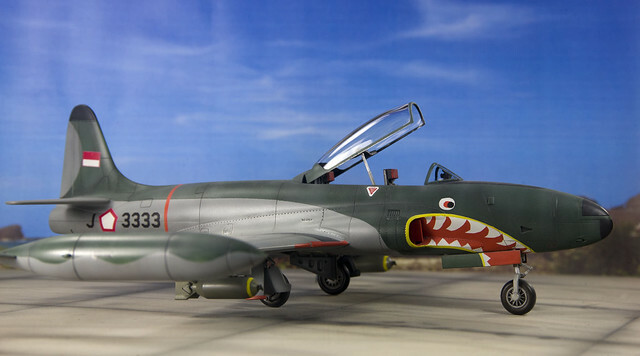 At their base in Madium, Java, a young lieutenant was inspired by the Flying Tiger’s P-40s and ordered the mechanics to paint all of the assigned T-33s with the famous shark mouth before they moved out. To modify the T-33A with ground attack capability, the depot mechanics decided to wire up the Silver Stars with ex-Soviet bombs, rockets, and gun sights which were abundant and easily available. Several aircraft were sent to Baucau to provide air-to-ground support for six month in 1978. J-3333 was one of the aircraft that served in the conflict. Today, it serves as a guard gate at the TNI Air Force Academy in Bandung, Java. IN In detailing the model, I focused my attention towards the landing gear bay, flaps, and cockpit area. Most of the modification were adding details with stretched sprue, copper wire, two-part epoxy putty, bits of masking tape, and styrene plates and tubes. Using reference photos as guidance, the modification helped gave some “meat on the bone’ to areas that are quite visible but pretty much too simple, bare or empty. The other aspect of the build that took much attention was correcting some of the basic error that came with the kit. The spine all the way to the front of the canopy was rather curvy. I decided that the best way was to scrap off the plastic using a scalper while continuously eye-ball the progress. Scrapping more plastic on the area in front of the windshield. Once I was satisfied with getting the level that I wanted, I carefully sand the area down to regain its natural curves. Filling and sanding were next. I opted to used Tamiya two-part epoxy putty to deal with gaps and steps, notably around the wing roots and areas along the lower fuselage. With so many areas being filled, sanded, and scraped, the original panel lines were either completely gone or became very vague. This is where I had to re-create the pane lines back. The kit had few panel lines to start with, which actually helped the process. My main tool for re-scribing are the Hasegawa’s Tri-tool PE rulers and Tuner Model’s mini re-scriber. Before moving on, I sprayed the model with Tamiya base primer (white) and checked for any imperfections. 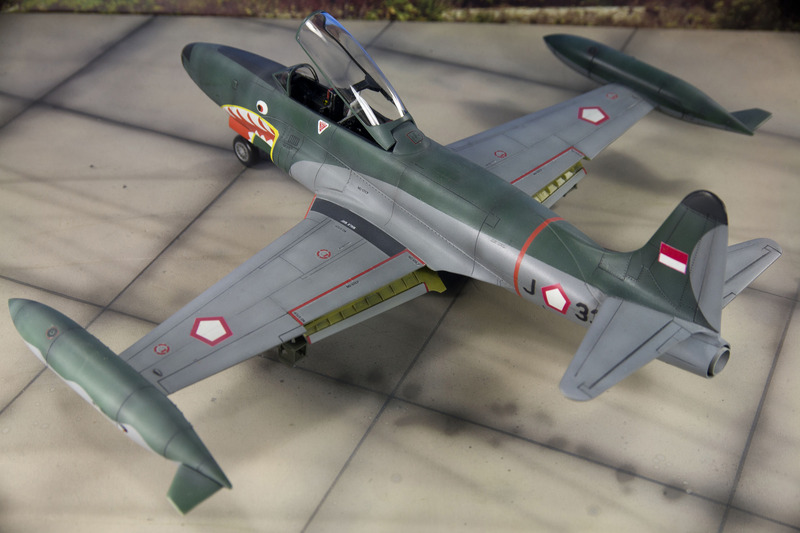 TNI-AU T-33s were painted in two tone dark green and grey hard-edge livery. 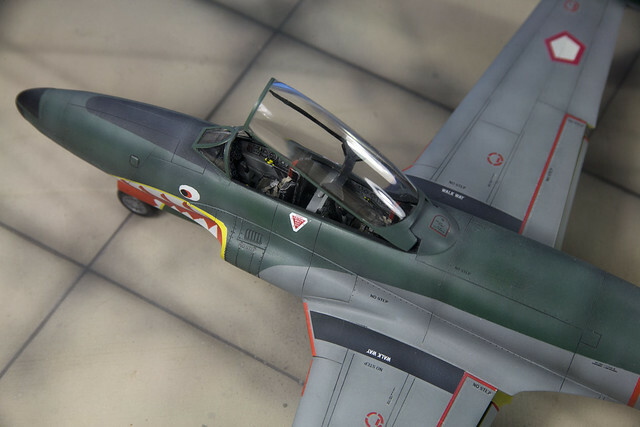 To start, I preshaded the panel lines with XF-1 Flat black and continue to cover the main fuselage and wing-tip fuel tanks with XF-70 Dark Green 2 (IJN). What came next is an extensive masking effort to cover the greens so that the grey paint can be sprayed on later. The masking consist of straight, curved, and curvy lines. The pattern on the starboard and port side of the aircraft is identical. To help achieve that, I used the help of a Rotring French curve ruler set. Before many any cutting work, I measured the potential work area and sketched a rough plan on a piece of paper. Next was laying down the first masking tape to create the basic shape . I used masking tape from ACE and French curves to guide the cutting. I sprayed a light mist of Tamiya XF-2 Flat White. I did a few light and quick passes. Remember not to spray too thick as it will cause paints to build up along the edges of the masking line. Once the white is dry, I continued to make “teeth” templates using Tamiya masking tape. Since you need a pair (left and right side), try to make it as consistent as possible. I solved this by drawing and cutting out a set of teeth for the left and right side at the same time. I sprayed a coat of Tamiya XF-3 Flat Yellow on the outer edges of the shark mouth. Again, doing it light and quick to avoid any runoffs. Another layer of masking tape to cover the recently done yellow. Make sure that all the edges are tight or else paint will seep in really ruin a good paint job. A good mix of Tamiya XF-7 Flat Red was swiftly sprayed on to the layout. Careful not to get any runoffs. Make sure you have enough masking coverage. Red is a very noticeable color. If you over-spray your masking tape, they will show up very clearly on other paints (You don’t want that to happen, do you?). Time to reveal the results of your hard work! Carefully peel away the masking tape. Never rush on a delicate job like this. Always take your time. Don’t forget to paint the eye too! I painted the eye using the same method as painting the shark mouth. There were two phases of the decalling process. The first one started out by applying the stencils that came with the original decal sheet. I uses Revell Decal Soft to help them adhere more to the kit. The second phase consisted of creating DIY decals for the TNI-AU that consist of the roundels and hull numbers. Initially I made measurements using a drawing compass (protractor) based on available reference photos. I then used a commercial vector-graphic software to lay the plan out. Eventually I printed my decals on transparent and white decal papers using an Epson Stylus printer. The roundels needed to be on white paper, while the TNI-AU and hull number stencils were printed on transparent ones. These are home-made DIY decals so I had to first coat them with water-resistant clear coats. For that I used Testor Glosscote Lacquer. I gave both decal sheets a reasonably thick layer of clear coat. Still its no guarantee that the treatment would work. The quality of home-made decals are attributed in part by the paper and printing quality. The last bit of work was to add some washes to the panel lines using a water-based poster color called Sakura Poster Color. To improve the flow and clean-up, I added some liquid dish-washing detergent into the sludge. I sprayed a final coat of Testor Dullcoat Lacquer over the entire model to get a dull and matt finish. This was the only dull coat I had during the project time frame. It was sufficient and it served its purpose, although I would have used Mr. Hobby Top Coat Flat instead as it gives better flatness with lesser effort. Overall I am very satisfied with the results. A challenging project both at the construction phase, but more so at the painting and detailing. I don’t really think there was any way for me to take short cuts on the process, unless of course I chose to by resin seats, wheel bays and aftermarket decals.